You know that feeling when something has been staring you in the face, and you were so blind to it you didn't even notice you didn't know what it was for? That's how a whole lot of people feel right now. After years of soggy salads, eyes have been opened by a simple Tweet. Blogger Gracie Villegas showed off a little meal prep before a trip last week. But it wasn't the meals that caught everyone's attention. It was the containers. More specifically, it was the container lids that caused a stir. People began proclaiming how their eyes had been opened. 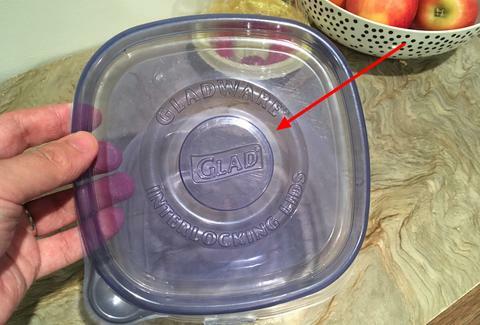 They never knew the circle in the middle of a Glad container lid had a purpose. It's just always ... been there. It turns out smaller containers exist that snap right into that little circle. All those soggy salads? They were tragedies that could have been avoided. You may have those lids but lack the tiny containers. That's the source of confusion for many. Almost all Glad lids are compatible with the smaller cups, a spokesperson told the Huffington Post. However, the little dressing containers only come with the To Go Lunch Containers. They're not sold separately. So, you might have to stop the imaginary montage of you winning an award for the sweet lunch you're going to pack. You'll need to buy a bunch of new containers before that happens.